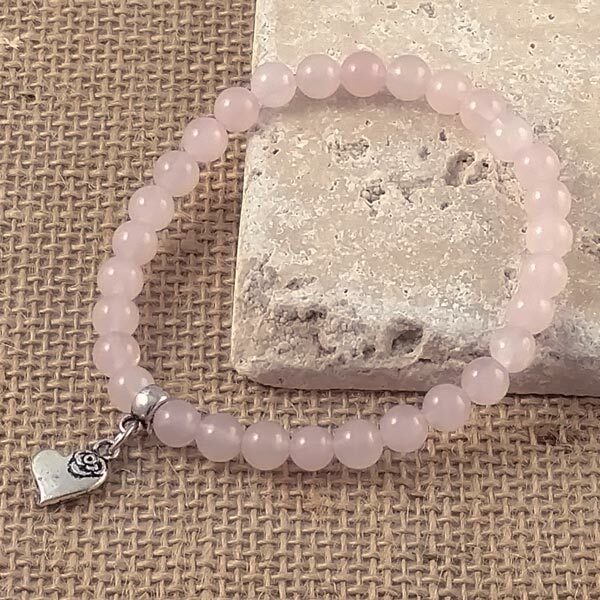 Loving energy abounds in these Rose Quartz bracelets. Choose a Lotus or Heart Charm. 6mm natural Rose Quartz beads. Promotes heart healing through positive self love, self esteem, self image and body image. Aids opening to the Goddess and the God within. Heals the emotional body and aids in learning to feel one's emotions. Heals heartache and loneliness and induces emotional release and clearing. Fosters acceptance, inner peace, forgiveness and self forgiveness. Greatly assists in easing fear and soothing grief. Rose Quartz has a trigonal crystal system, is a primary formation and is in the mineral class of oxides in the quartz family. Pink in color, Rose Quartz is formed magmatically in chunky masses. When polished, sometimes the formation of stars (asterism) can occur from rutile crystals embedded in it. It is especially noticed when shaped into larger spheres and can sometimes occur in smaller beads. 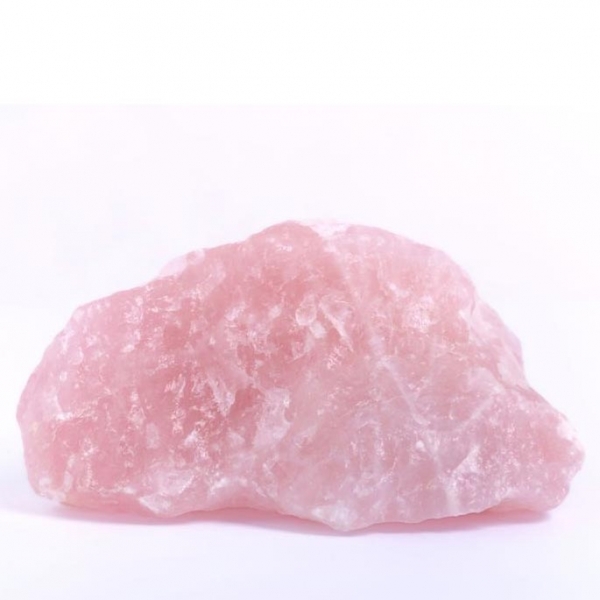 Rose Quartz is effective sitting out to sooth your environment, carried with you, is quite calming during meditation, or can be worn on your body. Rose Quartz makes us gentle yet firm. It is not a question of giving in, rather an awareness of a gentle, soft nature overcoming the harder, stronger one. It encourages helpfulness and opens the desire for a pleasant attitude. Rose Quartz provides empathy, sensitivity and sometimes over-sensitivity. It encourages appropriate self love, a strong heart, romance and the ability to love. Rose Quartz will liberate us from worry and draws attention to the fulfillment of our elementary needs. Rose Quartz stimulates blood circulation in the tissues. It fortifies the heart and sexual organs, helps with sexual problems and encourages fertility. Rose Quartz benefits all signs. It is recommended for artists, acupuncturists, lecturers and those suffering from low self esteem. Its Energy is Receptive, Planet is the Moon, and Element is Fire. Through the centuries, Rose Quartz has been considered a love stone or a fertility crystal. Its value as a nurturing friend can not be overstated. By most accounts, it seems to deal with energy on an emotional level. It may seem odd to give what appears to be an inanimate object emotional characteristics, but it does seem to have a sympathetic nature when it is in tune with its owner. With its receptive energy, Rose Quartz is used to open the upper heart chakra. Its magickal applications have included promoting peace, happiness and fidelity in established relationships.